He warned the $50 fee is just a hop, skip, and jump to $300. 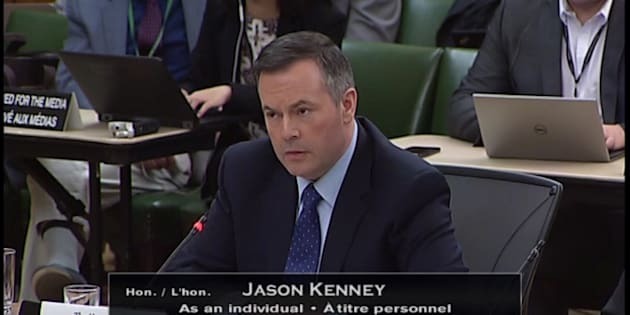 Jason Kenney appeared before a parliamentary finance committee to talk about the federal carbon tax on May 7, 2018. OTTAWA — Jason Kenney arrived on Parliament Hill Monday ready to pick a fight against Liberals over the federal carbon tax. "This is a frog in the pot syndrome," the Alberta United Conservative Party leader told a House of Commons finance committee meeting. He accused advocates of a carbon tax of "trying to get people used to paying more to heat their homes and to drive to work." Jason Kenney speaks to the media at his first convention as leader of the United Conservative Party in Red Deer, Alta., on May 6, 2018. Conservatives are fighting a provision in the government's budget bill that would give Ottawa the authority to impose a carbon price on provinces and territories that don't have one. It proposes an initial $10 per tonne fee, increasing to $50 in 2022. But Kenney warned the $50 fee is just a hop, skip, and jump to $300. He likened the tax as a vehicle for the federal government to assert "more control" and an opportunity to relay "more revenue to politicians." The former MP found himself grilled by Liberal MP Jennifer O'Connell, who accused the Alberta politician of saying things about climate change "for political attention." She asked him if he believes in climate change and if it is caused by human activity. Kenney said "yes," but hedged the strength of the correlation between the two is arguable. "I stand by what I said, that there's a debate about the precise degree to which there are anthropogenic causes behind climate change," he said. "I have to tell you, I'm really happy to hear you say that today, except you keep contradicting yourself on Twitter or in speeches to your base," O'Connell responded. "You also said there's no connection between large scale weather events and broader climate change issues." Kenney responded by saying he tends to defer to expert opinion on those issues. O'Connell pressed him, asking why he continues to sow doubt about climate change in public. "Should we believe you now, or believe the Jason Kenney of Twitter?" she asked. Kenney was the lone voice at a table of witnesses, outlining his opposition to a federal carbon tax and urged Liberal MPs around the table to be forthright about intentions to eventually raise the price to $300 to meet Paris climate targets. He called it a tax that punishes people for living normal lives in cold, northern climates. Alberta currently taxes greenhouse gas emissions at $30 per tonne. Earlier, he told reporters that his party is making an application to the Saskatchewan Court of Appeal for intervenor status on that province's constitutional reference case over carbon pricing. "We believe that it is an unconstitutional intrusion on provincial jurisdiction," he said. "We are going to stand up for Albertan consumers." Putting a price on pollution is one way the government is trying to reduce greenhouse gas emissions. Other measures include moving remote and Indigenous communities away from diesel and phasing out coal-fired electricity. Saskatchewan Premier Scott Moe launched a reference case last month, asking if a federally imposed carbon tax over-steps provincial jurisdictions. Environment Minister Catherine McKenna is adamant that it does not. She told reporters it's well within the government's jurisdiction to put a price on greenhouse gas emissions. "Canadians want action on climate change," McKenna said. "We're seeing the impacts of climate change, whether it's floods, it's droughts, it's forest fires, and we need to take smart, practical action."